New Michelin Primacy 3 Premium Tyres: Are They 3 Ways Better? The VUFO institute based at Dresden University runs what is probably the most comprehensive analysis of vehicle crashes in the world. It’s called the German In Depth Accident Database (GIDAS), so far based on 68,000,000 pieces of information gleaned from the study of 20,000 crashes over 3 years within a 50-kilometre radius of Dresden. This is reckoned to be generally representative of most of Europe, though obviously not as representative of the dryer, more southerly European countries as those on the same latitude as Dresden. 70% of crashes occur on dry roads. 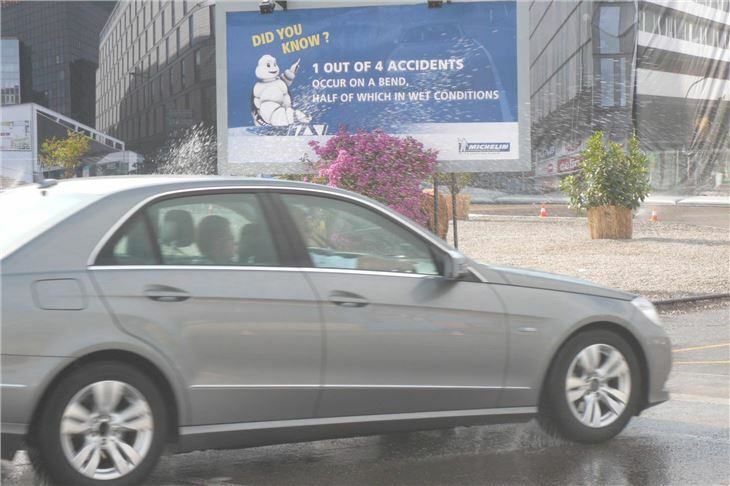 75% of crashes occur on straight roads, of which 20% are in the wet. 60% of crashes occur at relatively low speed in an urban environment, 40% of which are in a straight line on dry roads. In 50% of these crashes the driver is braking prior to the crash. 30% of rashes occur in wet conditions. 25% of crashes occur when cornering in the wet, but these tend to be the most severe in terms of vehicle damage and injury. 50% of crashes on corners are in wet conditions; 50% in the dry. Stop the car in a shorter distance in the wet. Stop the car in a shorter distance in the dry. Give better grip when cornering in the wet. Yet still offer Michelin’s traditional qualities of fuel economy and longevity. Obviously a tyre that stops a car in a shorter distance mitigates any damage to other vehicles or people, even if it does not completely stop the car before impact. Better to hit a pedestrian at 5kmh than at 8kmh, for example. 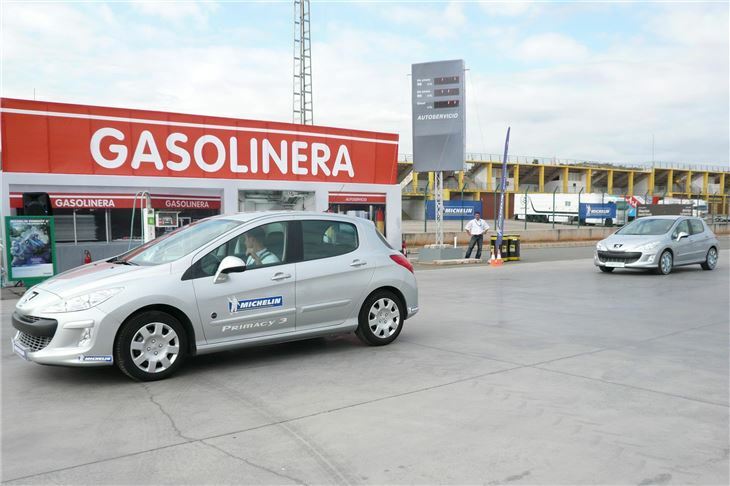 We were invited out to a specially constructed ‘urban’ environment near Valencia to put this to the test. To stop a car in a short distance in the wet a tyre has to disperse water from between itself and the road surface very effectively. It does this by ‘sipes’ moulded into the tread. But thick sipes allow too much movement of the tread blocks for good performance in the dry. So Michelin developed a new method of moulding that creates sipes just 0.2mm wide, allowing the tyre to disperse water in the wet yet that ‘self block’ and behave as close as possible to a treadles tyre in the dry. The tyres were 205/55 R16s on VW Passat TDIs. Using sophisticated GPS equipment, we tested the distance to stop a VW Passat from 80kmh to 10kmh in the wet against a competitor. I managed a pathetic 30.4 metres on the competitor (the worst of our group, I’d better add). 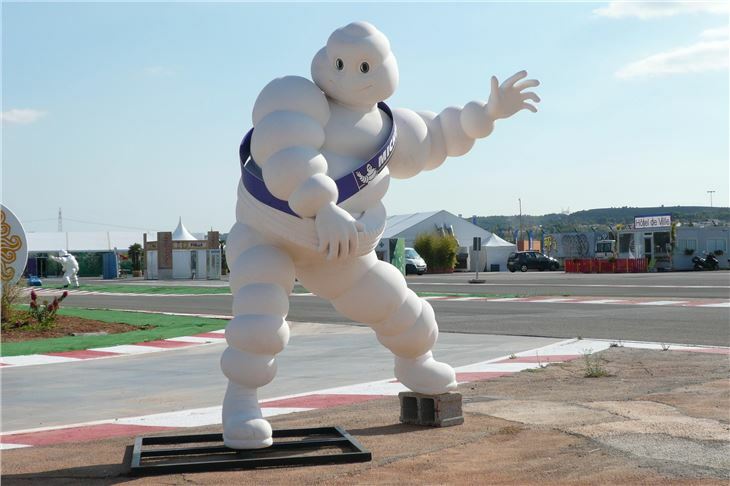 Yet 25.7 metres on the Michelin Primacy 3s. The average stopping distance of all ten of us was 27.9 metres on the competitor tyre and 25.6 metres on the Michelin Primacy 3s. 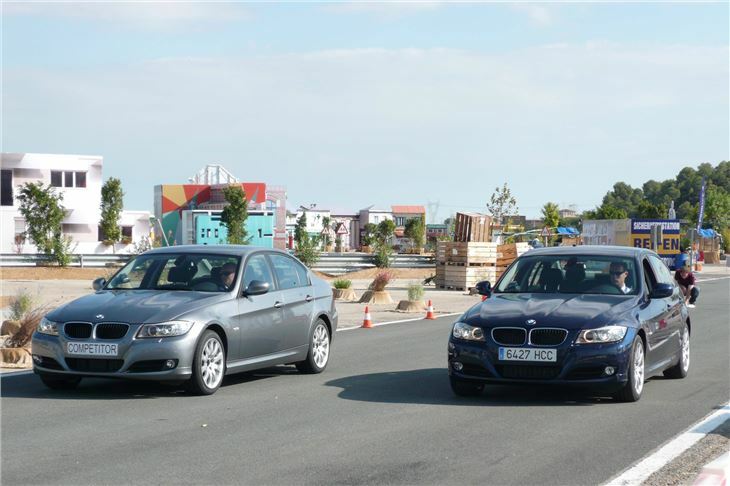 German TUV testing from 80kmh to 0kmh showed an average 1.5 metre shorter stopping distance compared to the average of the competitors. The tyres were 225/45 R17s on BMW 320ds. Stopping from 80kmh to 10kmh I managed 23.9 metres on the competitor tyres and 22.5 metres on the Michelin Primacy 3s. 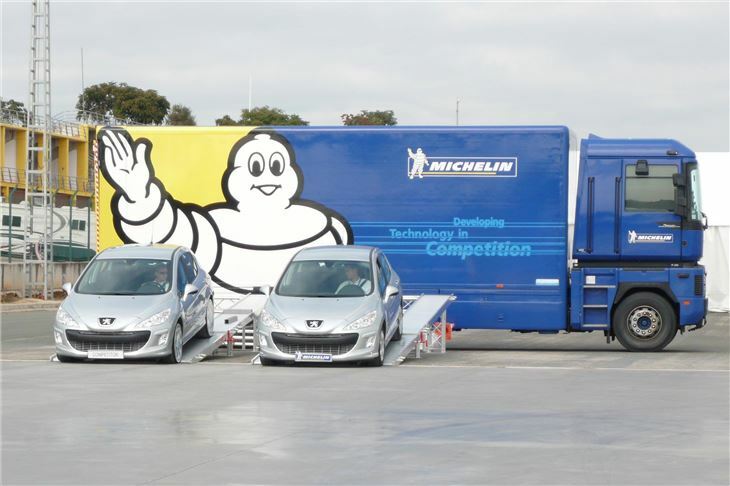 The group results were 23.8 metres on the competitor and 22.5 metres on Michelin Primacy 3s. TUV results braking from 100khm to 0kmh showed an average 2.2 metr4es shorter. 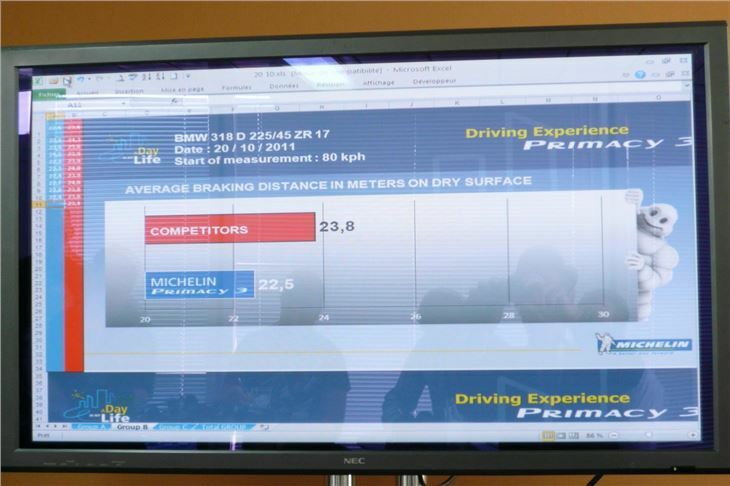 From 70kmh to 0kmh the average braking was 1 metre shorter. And from 50kmh to 0kmh, the average braking was half a metre shorter. The reason is that the self-blocking sipes keep more of the tyre tread in contact with the surface of the road without distortion. Or final test was wet cornering, driving a rear-drive Mercedes E220CDI on 225/55 R16s at 60kmh around a large roundabout subjected to a constant shower of water. At 60kmh the competitor tyre constantly broke away, either at the front or at the back. Yet the Michelin Primacy 3 kept the car on line. 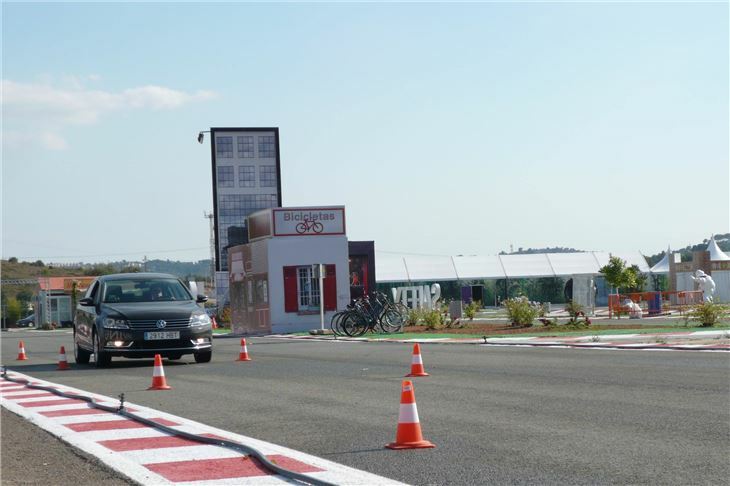 TUV tests show a 3kmh quicker cornering speed for the Michelin Primacy 3s compared to competitors before breakaway. The tyre compound plays an equally important part in this as the moulding. The compound consists of three elements: silica as the reinforcing agent, resin as the softeners, and three different elastomers. The secret is in the combination of these. 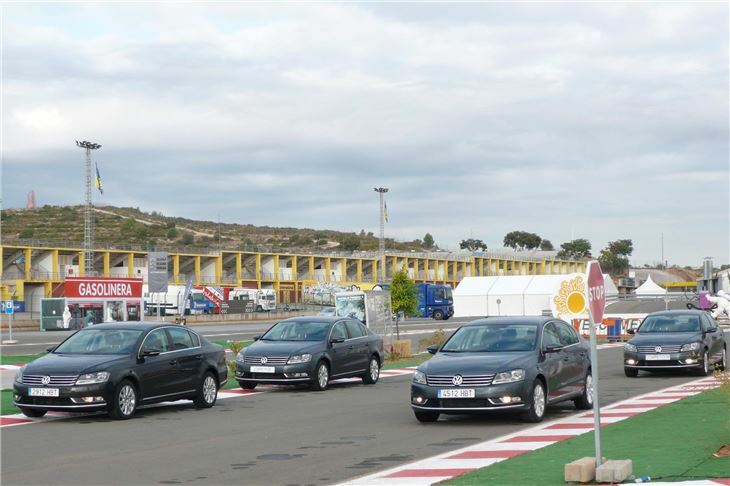 Low rolling resistance is the key to both longevity and fuel economy, so as a last demonstration we were treated to the sight of two Peugeot 308s running off identical ramps side by side. Needless to say, the 308 on Michelin Primacy 3s travelled considerably further, bearing out the Michelin claim that over the life of a set of tyres the fuel saving will be around 70 litres. This is equvalent to a drop of 4g/km CO2, so can put a new car into a lower tax band. No price increase is planned for Primacy 3s over the current Primacy HPs that they will replace. And by 2013, ‘zero pressure’ (runflat) versions will be available. 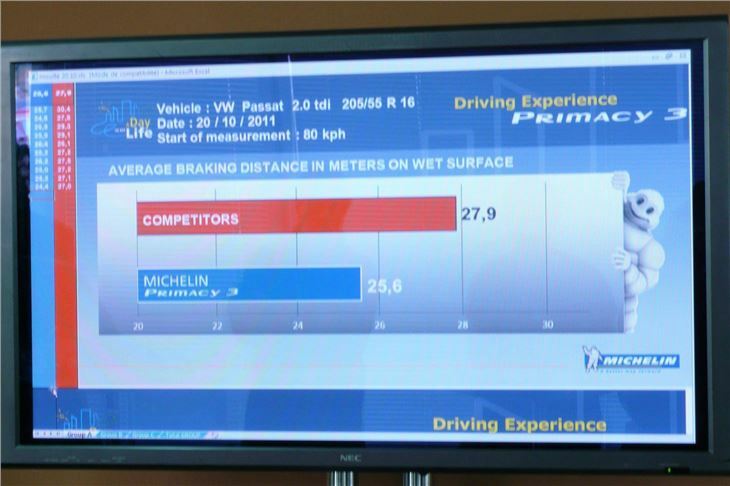 Primacy 3: Better wet braking, better dry braking, better wet cornering. Michelin Primacy 3 tyres will be available in the UK from February 2012.